With all of the discussion and debate that swirls around “sourced” whiskey – whiskey produced in a facility not owned and operated by the bottler and/or brand name on the bottle – it can too often go unsaid that there are two different ways a whiskey can be sourced. The first and often more controversial way is when a bottler or brand name purchases mass-produced barrels of an indiscriminate recipe distilled and aged at one of the larger distilleries and puts it out to market with less-than-transparent information. The ‘artisanal‘ bourbon that is really 3 year old sourced Indiana rye, or the fancy bottled and elaborate storied family recipe that is actually excess barrels purchased from an unnamed distributor. This form of sourcing can be harmless – I’ve enjoyed many sourced and mysterious bourbons. But it can also be a gimmick, and there are many overpriced, underwhelming bourbons on the market made from a basic recipe by a bulk manufacturer and bottled with a ‘family heritage’ story and a hefty price tag. Its unfortunate, and gives sourcing a bad name. Legendary bourbon blogger Chuck Cowdery calls them “Potemkin Distilleries” and on the whole, I concur with his opinion: failure to demand transparency in what we drink only encourages others to be (at the least) disingenuous or (even worse) underhanded. The other way whiskey can be sourced is much more interesting. This form of sourcing involves a distiller, NDP, or brand having their recipe distilled to their specs at a larger distillery. For example, everyone knows the name Pappy Van Winkle, but Pappy is distilled by Buffalo Trace to spec – the same as John J. Bowman. John J. Bowman’s distillery (The A. Smith Bowman Distillery) is most interesting, because they are, in fact, a distillery. They are owned by Sazerac, the same as Buffalo Trace (and Blantons and Taylor and Stagg and etc). They are in Virginia, not Kentucky, and have been at the current location in Fredericksburg, since 1988. What makes their process so different is that they have Buffalo Trace do the first distilling, to make the ‘White Dog’ corn whiskey. Then the distillate alcohol is shipped to Bowman, where they distill it two more times. Then it is barreled, stored and aged. I have even read that the barrels are stored upright, which is again very different. So how is this Virginia Straight Bourbon Whiskey? John J. Bowman Single Barrel comes without an age statement, a barrel or bottling number, or any other indicators that would allow me to match this single barrel with any others. Its unfortunate, because there is much about this whiskey I would like to find again! The bottle itself is quite lovely, with its image of Col. John J. Bowman exploring Kentucky on the back. It’s no slouch at 100 Proof. I just wish I knew a few specs. The nose is fantastic – caramel, vanilla, oak, and a soft corn. It was a sweet nose, and as the soft corn gave way to the oak and wood, I almost couldn’t help but forget it was the dead of winter and think of soft campfire and roasting corn. The taste was as smooth – a thick texture, with a great sweetness up front, but never overwhelming. Again, vanilla, and a vanilla almost sugary and frosting like on the front of the tongue, while the thick mouthfeel showed off a rich woodiness blended with a slightly tart citrus. Orange and a tiny bit of raisin, before resolving to a smooth finish of cinnamon, walnut and dry oak. A second sip showed me a bit more of the rye – along with the cinnamon, there was a hint of clove and even a bit more of that raisin, roasting corn taste. I found the John J. 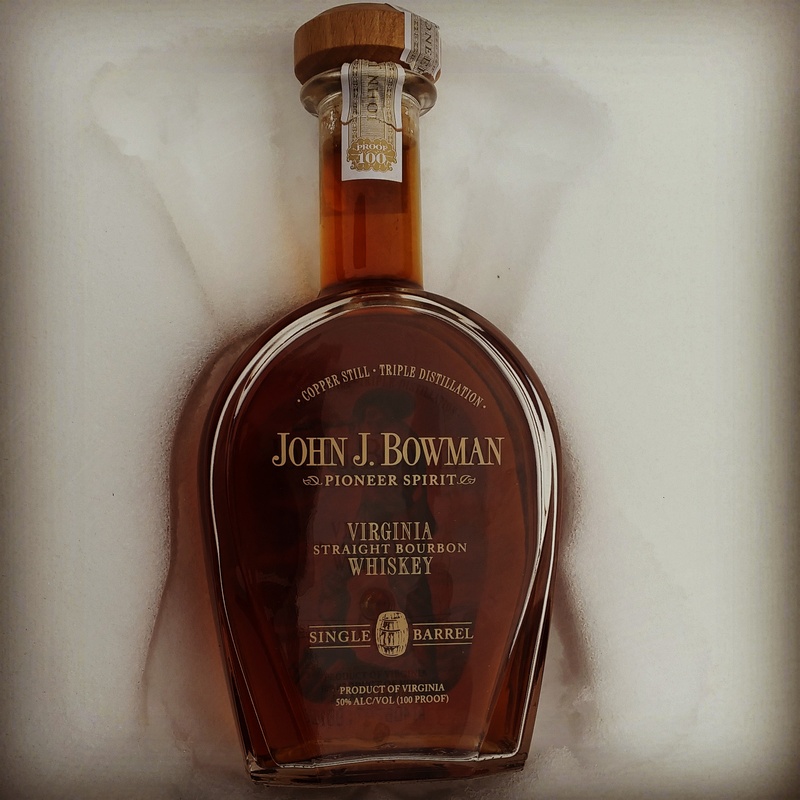 Bowman Single Barrel to be outstanding – a wonderful sipping bourbon, and a nice addition to the regular rotation. Most impressive. I can see why it’s competition scores have seemed to rise ever year. I am so glad that you enjoy this Bourbon!